directly from the author and artist! Tracks author Eric D. Goodman is also the author of Flightless Goose. As reviewers have pointed out, Flightless Goose is an entertaining and simple story, but the book touches on a number of subjects: bullying and teasing, treating others with dignity and respect, overcoming difficulties, focusing on positive strengths, self-worth, confidence, compassion, dealing with adversity, being a friend, coping with disability, the value of being different, practicing road and automotive safety, tolerance, diversity, and more. Children understand, without feeling as though they’ve been taught, that everyone is different and everyone can make a difference. A number of reviewers, mothers, and educators have endorsed Flightless Goose as a great gift for any child, especially those between 2-9 years old. It’s a great way to open a discussion on a number of important topics. Catch your copy of Flightless Goose. 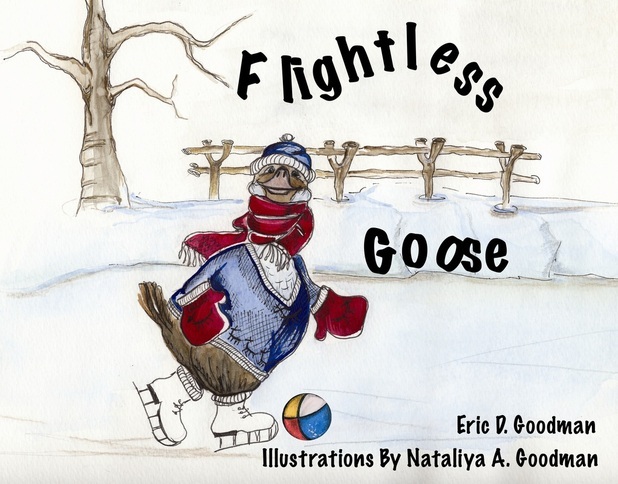 “Flightless Goose is a beautiful tale along the lines of the old favourite The Ugly Duckling. The illustrations by Eric's wife, Nataliya, are classically done and remind me of Charles Dickens' Oliver Twist. This book will be one my own children will cherish and it will be passed down for many generations." "The book sends out an important message about seeking support if you’re being bullied and about not letting a bully break your spirit." --Is There a Bathroom on this Ship? Featured in the Los Angeles Times, Baltimore Sun, JMWW, Eight-Stone Press Baltimore Shopping Guide 2009, Rodgers Forge Newsletter, author Bathsheba Monk’s website, and on blogs, and websites around the world.